To describe how Miller’s TIG stick welding machines compare with other products on the market, it seemed only apt for Welding Industries Australia (WIA) specialist Glenn Callinan to use a sports car analogy. Especially when these specific machines – the Dynasty and Maxstar range – are employed at Triple Eight Engineering. To illustrate the difference between the Miller welding machines and competing welding machines, Glenn used the analogy of a luxury sports coupe versus a sedan. Essentially, it comes down to quality. Both in the product build and in its performance. The Miller Dynasty and Maxstar are American-designed and made to last. The Miller welding machines also have the broader range of features in their portfolio compared with similar products. One key feature that is exclusive to the Dynasty and Maxstar 210DX machines is the Auto-Line Power Management Technology. This allows for multi-voltage input and can be plugged into various outlets on a power outlet. The Auto-Line circuit boosts primary power to a higher, constant voltage. Even if the incoming voltage varies widely, the circuit will ensure a rock-steady welding or cutting arc. This feature has a number of benefits including: better weld quality from uninterrupted production, location flexibility, fewer amps, electrical efficiency and more welding output on the primary power. “With the Auto-Line, end users have the benefit of being able to use the welding machine in a workshop or out on a site with single or three phase input. It’s also generator-compatible, so it can be used in remote areas where they run off generators,” explains Glenn. Another unique feature of these welding machines is the wireless foot control. Removing leads from the floor ensures a much safer working environment. Also, the TIG can run on either an air-cooled or liquid-cooled system. According to Glenn, the range of controls that the Miller welding machines offer is much more comprehensive than other products on the market. Blue Lighting high frequency arc starter for non-contact arc initiation. This provides more consistent arc starts. Pulse – pulsing can increase puddle agitation, arc stability and travel speeds while reducing heat input and distortion. DIG control – allows the arc characteristics to be changed for specific applications and electrodes. Sleep timer – this conserves electricity by powering down the machine if it has been idle for a certain time. Stick-stuck – this detects if the electrode is stuck to the part and turns the welding output off to safely remove the electrode. Hot start – adaptive control provides positive arc starts without sticking. Fan on demand – variable speed fan adjusts to match the cooling requirements. Wind tunnel technology – protects internal parts from airborne contaminants. Pro-Set technology – provides a starting point for new welders by giving them pre-set parameters and controls. While the two Arc and TIG welding machines share many features and are both considered the most premium welding machines of their class, they are suited to different applications. The Dynasty 210DX is an AC/DC TIG welding machine that can weld aluminium. It is ideal for precision fabrication and maintenance jobs split between a workshop and site. 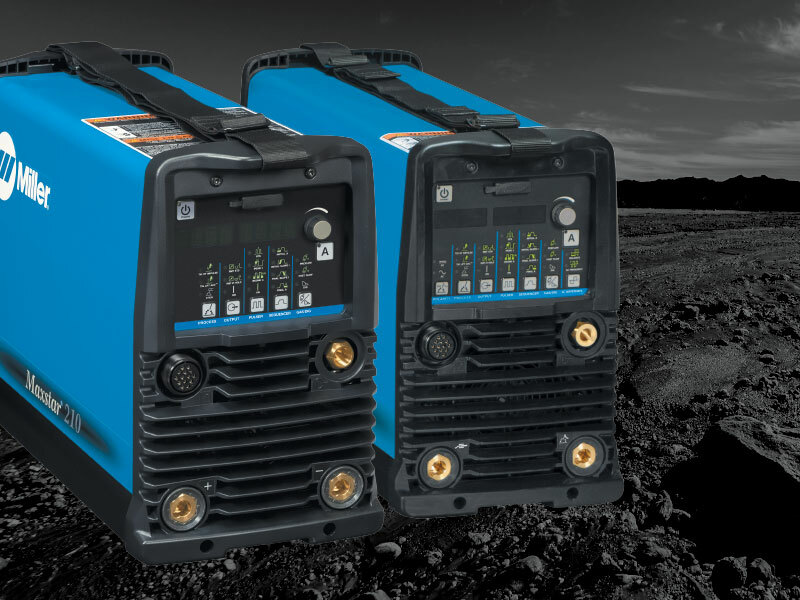 While the Maxstar 210DX is a DC TIG that is appropriate for welding exotic materials and steel, including stainless steel, copper and titanium. Advanced squarewave – which provides fast freezing puddle, deep penetration and fast travel speeds. Soft squarewave – this enables a soft, buttery arc with maximum puddle control and good wetting action. Sine wave – is for customers who prefer a traditional arc with quiet and good wetting. Triangular wave – this reduces the heat input and is good on thin aluminium. It has fast travel speeds. As Glenn points out, these Miller welding machines are premium products and the most advanced of their kind on the Australian market. They also have an unparalleled three- year warranty – the TrueBlue warranty – which includes parts and labour.